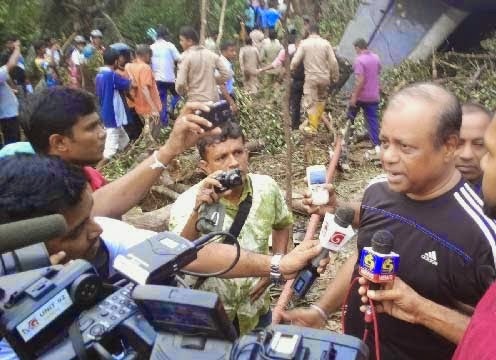 An Antonov plane belonging to the Air Force flying from Katunayake-Ratmalana has crashed in Hokandara, Athurugiriya - Airforce spokesperson Wing Commander Gihan Seneviratne said. Four persons were reportedly inside the aircraft. The rescue teams have recovered three bodies and another airman was rushed to the hospital with life threatening injuries,reporter said. “I heard an explosion. There were three bodies. One person was screaming for help. We immediately sent him to the hospital and attempted to extinguish the blaze,” an area resident said. A thick fog and mist has engulfed the area, it was reported. The police, Special Task Force, and fire brigade are at the location for rescue operations.